Prefer to wait out the Black Friday madness and shop from the comfort of home on Cyber Monday? You're not alone. Adobe Digital Insights predicts that retailers will see a staggering $7.8 billion in revenue from Cyber Monday deals this year, up more than 17 percent from last year. If you're among the growing throngs of online bargain-seekers, here's what you should know before heading online. More retailers are offering steep discounts all weekend before Cyber Monday, and some will extend them for days after Cyber Monday, too. Amazon is a prime example — pun intended. The online giant will sprinkle its deals over the course of the entire week. The same is likely from Walmart, which is unsurprising, as it remains locked in a brutal price war with Amazon. The bottom line? Don't wait until Monday night if you're itching to spend. A lot of deals will go live as soon as the dust settles from Black Friday. 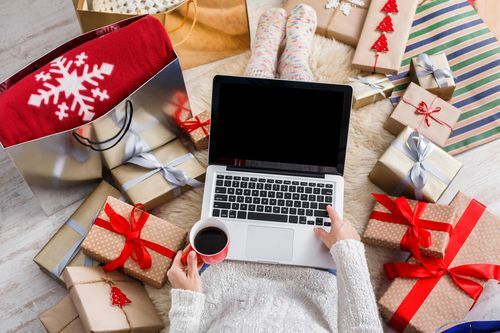 In fact, there's so much overlap between Black Friday and Cyber Monday that savvy shoppers will want to track must-have deals all weekend long. No, you won't be able to try it on in store, but Cyber Monday is the undisputed king when it comes to discounts on apparel. Expect deals like half off sitewide at many retailers and deals at big-box stores like $10 sweaters. As in years past, Gap and Old Navy will be offering 50 percent off everything. And this year, Target has already announced buy one, get one 60 percent off all apparel and accessories for men, women and kids on Sunday and Cyber Monday. Don't let travel deals get lost in your rush to put presents under the tree. Hotel rooms, tours, and flights go on sale on Cyber Monday as well as the day after, sometimes known as "Travel Deal Tuesday." Examples this year include 20 percent off Intrepid Travel trips booked through Nov. 28. And CheapCaribbean.com will offer up to 70 percent off all-inclusive beach vacations in destinations including the Dominican Republic, Jamaica, Bahamas, and Mexico. Finally, shoppers often overlook giftable small appliances in the Black Friday doorbuster rush for cheap electronics, so expect plenty of Cyber Monday discounts in this category. Still hot this year are air fryers, multi-cookers such as the Instant Pot, and always-popular, splurge-worthy classics such as KitchenAid mixers. Last year, a Professional 500 Series version sold for half off — a discount of close to $250 — on Amazon. While we certainly expect some good Cyber Monday toy deals, particularly at warring Amazon and Walmart, toy shoppers shouldn't be quite as concerned that they're missing bottom-dollar deals if they hold off. That's because retailers often slash toy prices as Christmas draws closer because they need to fatten their year-end bottom lines. Last year's notable discounts at Walmart included half off rec-room game tables at Walmart and a $100 drop on a massive Barbie Dreamhouse. When it comes to electronics, retailers tend to save their deepest discounts for Thanksgiving and Black Friday doorbusters. One Cyber Monday bright spot could be laptops, as there have been a number of good deals on Cyber Mondays past. This year, Lenovo will offer a ThinkPad X1 Carbon 5th Gen laptop for $900, down from $1,809. Experts also predict solid discounts to persist on 4K TVs, game consoles, Amazon devices, movies, and games, though they might not be quite as compelling as a few days prior. If you're a fan of a particular retailer, you're in luck. While Black Friday deals are mostly item-specific — think that super-cheap TV, air fryer, or those Beats headphones — on Cyber Monday, expect sitewide discounts as steep as 40 percent to 50 percent, particularly from apparel retailers. Already confirmed for this year is a 15 percent off sitewide discount from Target — rare for a big-box retailer. Some other deals already on our radar: 50 percent off at Gap, Old Navy, and Abercrombie and Fitch; 40 percent off at Philosophy; 35 percent off at Bauble Bar; and 25 percent off at Lord and Taylor and Mrs. Fields. Most dedicated Amazon shoppers are familiar with the year-round benefits of paying for Amazon Prime, but one Prime benefit that's often overlooked is early access to special deals. This Cyber Monday, Prime members will often get a half-hour jump on all of the site's Lightning Deals, which could mean non-Prime members won't get a shot at nabbing many popular products at a deep discount. Got a device with Alexa? You have an even bigger advantage, with access to some Cyber Monday deals starting Sunday if you shop using your favorite voice assistant. Target shoppers will want to take advantage of the aforementioned sitewide 15 percent discount. But they should keep in mind that REDcard holders can snag an additional 5 percent on top of that. Since most items will already be discounted and Target is offering free two-day shipping during the holidays with no minimum purchase — a first for the retailer — that can make for some pretty sweet deals. Best Buy will start its Cyber Monday sales on Sunday, and it will make some discounts available all week long. But since big discounts on electronics tend to stir a buying frenzy, be ready to pounce first thing. If you prefer to check things out in store, most deals will be available there, too. Last year's deals included $125 off Apple iPad Minis, $80 off wireless Beats headphones, and half off portable phone chargers. See something you want at a tempting discount? Don't wait too long to pull the trigger. While easier comparison shopping is a perk of waiting for Cyber Monday, be sure to put the item in your online cart before looking elsewhere for a lower price. In 2016, would-be shoppers saw out-of-stock messages 12 percent of the time, particularly when they were shopping for electronics or toys, according to Adobe. Shoppers who've been on the fence about Cyber Monday deals because of shipping costs can hop down now, with major retailers offering free shipping or at least a relatively low spending threshold for qualifying. Amazon has offered all U.S. customers free shipping with no minimum through the holidays (though two-day shipping remains a Prime perk). Walmart is offering free two-day shipping on most items, though a $35 minimum order applies; Target is offering free two-day shipping without any minimum order requirement. When discounts are as heavily promoted as they are on Cyber Monday, it's tempting to assume you're paying the rock-bottom price. But a browser extension such as Honey can help make sure you're getting the best possible deal by automatically applying coupon codes otherwise missed. It may also be worth using online chats to ask a customer-service rep if there are additional discounts — after all, you have nothing to lose but money. Shoppers should be especially cautious of online scams around Cyber Monday. Scammers will snap up domains that include major retailers' names in the URL and try to convince less-observant shoppers to fork over credit-card data. Others will phish for data by sending email confirmations about fake gift orders or touting deep discounts on hard-to-find products. Read up on ways to spot online shopping scams before snagging those too-good-to-be-true "deals." If you haven’t found the perfect gift for Mom yet, don’t panic: The web is packed full of great deals for Cyber Monday.